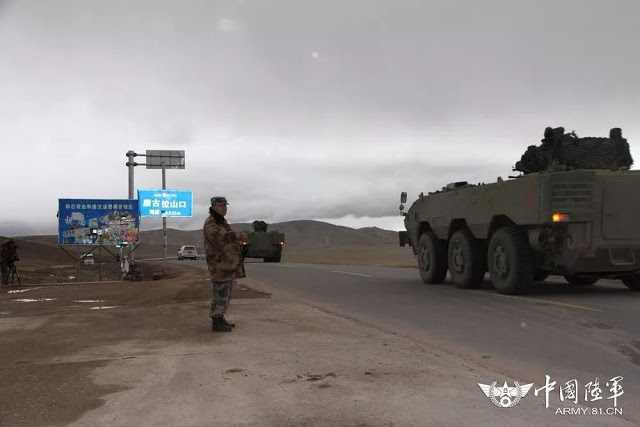 Images have emerged on online forums suggesting that China is testing new 6×6 amphibious armoured vehicles. The photographs appear to show two very similar, but subtly different vehicles. 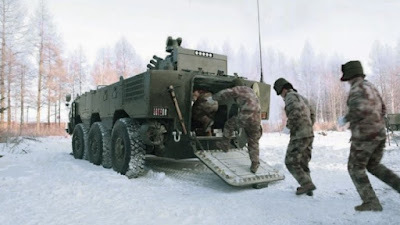 The first vehicle seems to follow a fairly conventional 6×6 layout, with driver and commander at the front and primary access for dismounts via a hydraulic ramp to the rear. The vehicle turret appears to be remote, thus allowing more space for dismounts in a smaller hull. The turret is equipped with a small electro-optic mast atop the turret, and a bank of grenade launchers mounted on either side of the primary armament, the latter of which appears to be a heavy machine gun. The vehicle is equipped with a forward-folding trim vane and ducted propellers for amphibious operations. The rear left of the vehicle hull seems to hold an auxiliary power unit. 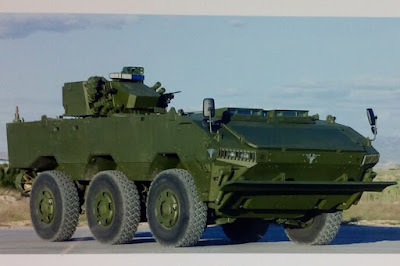 As with other amphibious vehicles, the engine intake and exhaust is likely to be mounted on the roof of the hull. In addition, there are two crew firing ports on each side, with cameras mounted in a recessed nook above the ports. It is possible that these cameras form part of a 360° awareness system for the crew. The second vehicle follows a very similar layout but is longer due to two box structures mounted behind the main hull on either side of the access ramp and door. One of these boxes contains the auxiliary power unit, with the second box likely meant for equipment storage. The turret has been covered with camouflage netting in the photographs but it appears to have been fitted with a panoramic commander’s sight on the right side of the turret. Benarkah info yg menyebutkan TUDM akan melengkapi Hornet C/D jadi full 1 skuadron dengan beli used? Dari negara mana? Lalu rencana pengadaaan CASA 235 Mpa berapa unit? Kalau nggak pakai kata "Akan", kita ga bakal tau satupun rencana/berita pengadaan alutsista mas. Setau saya Kuwait dan Australia yg pernah ada niatan untuk menjual F18 bekas mereka. Yg paling menarik justru Canada yg marah ke USA gara2 Boeing ada kasus hukum dengan perush avionik Canada makanya Canada aktif lobbying ke Kuwait dan Australia. Tapi bukannya kata mas Paul Baggio mereka haram akuisisi pesawat jet bekas seperti Indonesia ? Aussy kan Hornetnya A/B mas, infonya sih cari yang C/D melengkapi existing.